LOS ANGELES, CA (via Pera Padala)) – A week after breaking the nose of his sparring partner, Manny Pacquiao declared himself ready to mix it up with Antonio Margarito for the vacant World Boxing Council super-welterweight championship. “I’m ready,” Pacquiao firmly said after sparring for nine rounds with regular sparring mates Rashad Halloway, David Rodela and Rey Beltran Tuesday (Wednesday in Manila) at the Wild Card Gym here. “I’m almost there and if the fight is gonna be held this weekend, I’ll be 100 percent okay,” he said while signing autographs for his adoring fans inside his favorite Thai Food Restaurant just in front of the Freddie Roach-owned sweat shop in downtown Hollywood. “Ayos na ako. Pakisabi lang sa ating mga kababayan na huwag silang mag-alaala sa mga balitang half-hearted ang ensayo ko.Gaya ng dati, hindi ko sila bibiguin. Muli ay iniaalay ko sa kanila ang labang ito,” he said by way of allaying fears that he’s been too complacent in his training. Roach himself agreed, saying that after the seven-division champion forced a sparring partner he refused to name to pack up after his nose was dislocated Tuesday last week, he knew right then that there’s no longer reason to worry about in regards to the boxer’s condition. “His performance in sparring only means, he’s ready to fight to win. Manny will knock him (Margarito) out,” Roach assured. 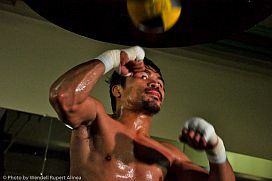 Pacquiao had actually completed the target 120 rounds of sparring that started in Baguio City in the second week of his one-month preparation in the country, but still he scheduled nine more rounds – five on Thursday and four on Monday before flying to Arlington, Texas site of the big battle against the “Tijuana “Tornado” Nov. 13 at the luxurious Dallas Cowboys Stadium. “We’re already in the tapering off stage of preparations with only 10 days left before the fight. Manny will knock him (Margarito) out,” he assured. Roach admitted once more he was a little bit worried upon arriving here from Baguio Sunday last week, what with the many distractions roaming around, quickly adding though that he never was in doubt as to Filipino icon’s capability to recover for lost time with his knack to embroil himself to many kind of disturbances, especially now that he’s a congressman.